You love yoga. You love being out on the water. So, why not combine them? What’s that? Didn’t know you could? Are you imagining something that excites and terrifies you all at once? Are you eager for the challenge? Stand up paddle board yoga (or, SUP yoga) is having its moment, and we’re here to tell you all about it. 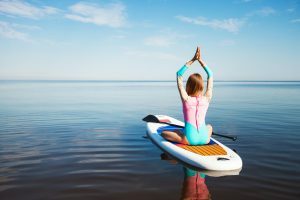 What is paddle board yoga? It’s yoga on a paddle board on the water – a paddle board thrill among thrills. If you haven’t hopped on your paddle board to try a downward dog, you’re seriously missing out. Here are the top 5 reasons to try paddle board yoga ASAP. Yoga is good for you, and paddle board yoga is even better for you. You get all the benefits of yoga – strength, balance, harmony – plus, you’re working your core more than you would, breathing in the fresh air, and soaking up the sun. That’s all the benefits of yoga, plus added core benefits, plus all the benefits of being in nature. Win. Win. Win. But who’s counting? How do we get the added core benefits? 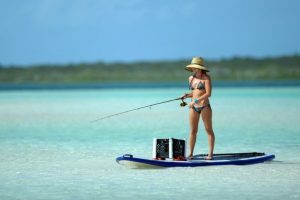 Without the stability of the ground just below, you engage your core so you can balance on your paddle board on the water. At the same time, making your way to and through your yoga poses. You have to paddle in and out of the water, too, and that’s a decent core workout all on its own. And I’ll bet you didn’t know what the ocean can do for your brain. All five of your senses are delighted. Oh, the sight, sound, smell, taste, and touch of an ocean breeze! There’s a popular yoga method called Ocean Breath that uses simulations of the ocean to relax the mind and encourage deeper, more connected breathing. So what could be better for you and your yoga than focusing on your breath while cradled by the real thing? You get a better workout and a more powerful recharge of body and mind on the water. 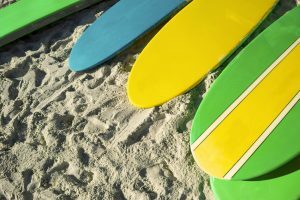 Paddle board yoga will help you refine your technique. 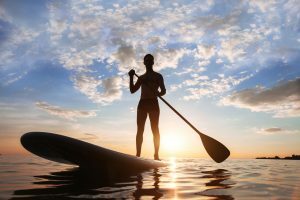 Since you’ll be working harder on the paddle board, you’ll become better acquainted with how you’re doing your poses, and experiment with how you can do them even better. There might be cheats or bad habits you’ve fallen into on land, where it is much easier to balance. The water has a way of exposing the ways you’ve been getting around the detail (or even not-so-detail) work. Maybe you’ve got more weight on one side in downward dog, for example. If you do, you can be sure that your board will let you know. A little more weight here than there can send you off the board and into the water. So you’ll look even better because you’ll be even better when you take your sea legs and arms and core back to your yoga practice on land. Yoga on land will feel like a piece of cake. You can start your paddle board yoga practice wherever you’re at, and know there’s always a new challenge awaiting you. Are you brand new to this fusion sport, and someone who likes to dip your toes in the water instead of jumping straight in? You don’t have to begin your paddle board yoga practice by standing. You can work your way up to standing, by sitting and then kneeling on your way. Once you’re comfortable standing, you can go after increasingly difficult standing positions, and compose movement sequences that never even occurred to you on land. Possibilities for growth and opportunities to feel empowered abound. If you can conquer yoga on land, you can conquer yoga on water. You have to work on your patience and determination, and someday you’ll be all but walking on water. 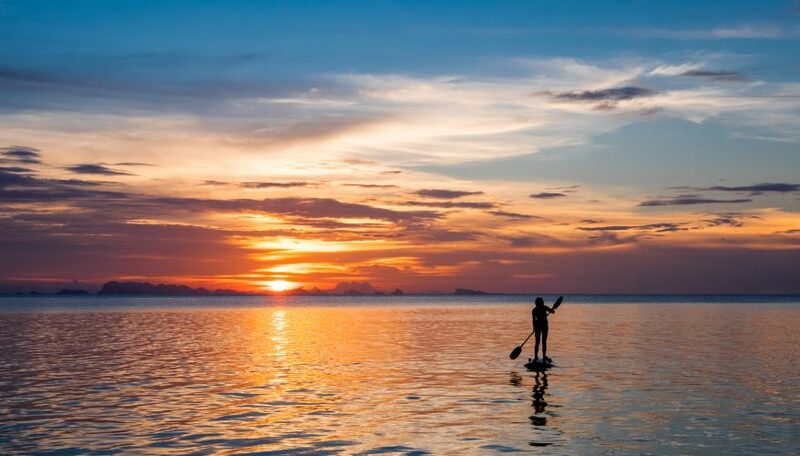 Paddle board yoga teaches you to let go of what you can’t control and face your fears. You have plenty of uncertainty and unpredictability that comes with practicing on the water. A wave or ripple could roll by at any moment, even if you’re practicing on calmer waters (which we’d recommend for beginners!). So you have to go with the flow, and you will learn to let go of trying to control everything – of trying to be perfect. Then you take those lessons back to your yoga practice (and your everyday life) on land. You might. There’s always that possibility. And chances are good you’ll fall in once in awhile, maybe more often when you’re just getting started, or trying out a new and more challenging position. But that’s part of the experience. You’re on the water, and, sure, the challenge is to not fall in. Even if (or when) you do, though, it’s easy enough to get back on the board and try again. Ask yourself: what’s so bad about a quick dip before I get back to it? Couldn’t I let the slip be refreshing? Pushing through the fear of falling into the water, or trying a new pose, or even trying it at all, is fundamental to paddle board yoga. Remember: You get knocked down, but you get up again. You can practice paddle board yoga solo or with friends. Need some time with yourself? Swim your board out and get some. Craving an adventurous and rejuvenating afternoon with friends? Find some paddle board yoga friends, boards for all, and go after it. It’s sure to be a memorable and meaningful time no matter what happens. If you think going with a friend will help get you out there for the first time, reach out to that friend you have who you think might be willing to try it with you. 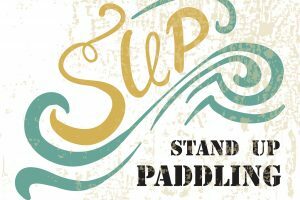 More interested in getting started by taking a SUP yoga class led by a master SUP yogi? There are plenty to choose from. 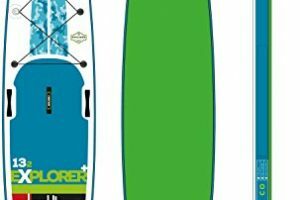 So, you need a stand up paddle board? We’ve got you covered. 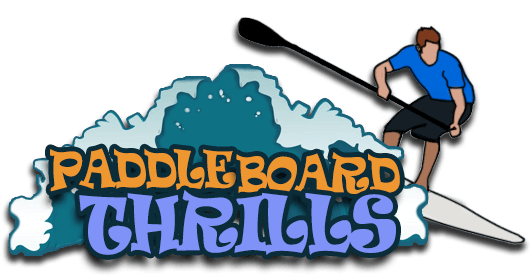 Check out our paddle board reviews, and get in touch with anything more you want to know. Are you paddle board yoga-ing yet? 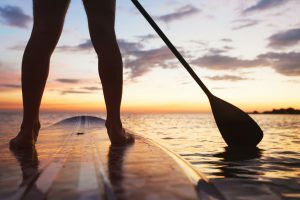 Whether you’re a yogi trying to mix things up or a nature lover looking for a new pleasurable and productive way to pass an afternoon, paddle board yoga is something you should try. It can change your life.